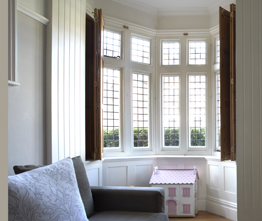 If repair or restoration isn’t an option, we’re happy to design and install brand new, bespoke casement windows. All of our new windows are made from sustainably sourced timber, and can match any moulding or profile to produce exact replicas of the original windows of any building. Our state of the art machinery means we can work to any specific requirements or details, and we also install a full draught proofing system into each new frame, so your new windows are as energy efficient as possible. We have worked extensively with local authorities and have specific expertise in listed buildings and conservation areas. Nearly all our new windows are double glazed with low emission glass, so they comply with the thermal requirements of current building regulations. However, the local planning authority might insist that your windows are single glazed to maintain the authenticity of a listed building – in which case, we can provide this too.